Weyden learns of Dimitrios and his sordid career when a corpse is washed up near Istanbul and a talkative Turkish police colonel (Kurt Katch) tells colorful stories of the great swindler’s crimes. The inquisitive little scribe thinks he can use this material for a book. 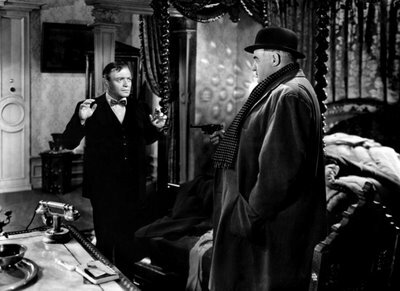 When Weyden meets one of Dimitrios’ victims in the (ample) flesh – the genial Mr. Peters, played by Lorre’s usual partner-in-crime Sydney Greenstreet – the two join forces to try to unearth the villain’s trail through war-threatened Europe. 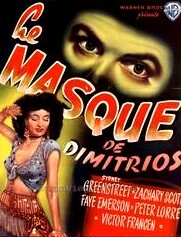 “The Mask of Dimitrios” was one of nine movies Peter Lorre and Sydney Greenstreet appeared in together. They piece together Dimitrios’ dark history as they cross paths with his other partners and/or victims, including blonde intriguer Faye Emerson, Victor Francen, Steven Geray, Eduardo Ciannelli and the irrepressible Florence Bates. As Lorre and Greenstreet close in on their prey, dark questions loom. Is Dimitrios really still alive? And who are his next victims? If you’ve never seen “Dimitrios” (from the novel known as “A Coffin for Dimitrios” in the U.S.), you’re in for a surprise and a treat. Faithfully adapted from master spy novelist Eric Ambler’s classic thriller by pulp fictionist/screenwriter Frank Gruber, shot in high noir style by cinematographer Arthur Edeson (“The Maltese Falcon,” “Casablanca”) and artfully directed by Romanian émigré and Warner Brothers’ “melodrama king” Jean Negulesco (in what is probably his best film), “Dimitrios” is an underseen gem of ’40s noir. It’s what used to be called a corker. To celebrate Marilyn Monroe’s birthday, on Saturday, June 1, Cinespia.org will present “Some Like It Hot” (1959, Billy Wilder) at Hollywood Forever Cemetery. Though the film is considered one of Tinseltown’s all-time best comedies, Marilyn reportedly objected to the fact that her character, Sugar Kane, actually believed her fellow musicians (Tony Curtis and Jack Lemon dressed in drag) were women. No girl is that dumb, she said. Nevertheless, the movie was a hit and her performance is unforgettable. You can read Mark Harrington’s review here. 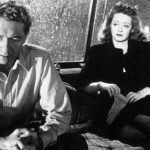 The Billy Wilder Theater at UCLA will present a choice double bill on Sunday, June 2, at 7 p.m.: two film-noir titles starring Burt Lancaster. 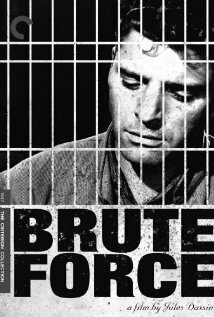 First is the prison drama “Brute Force” (1947, Jules Dassin), in which Lancaster plays an angry inmate desperate to escape his sadistic captors. “Brute Force” will be followed by “Kiss the Blood Off My Hands” (1948, Norman Foster). Lancaster plays a traumatized and violent ex-prisoner of war living in London and trying, unsuccessfully of course, to get his life together. Co-starring Joan Fontaine. The evening is part of the Lancaster centennial celebration presented by the UCLA Film & Television Archive and the Hugh M. Hefner Classic American Film Program. The celebration of Lancaster’s movies runs through June 30. Author Kate Buford is the special guest on June 2. Additionally, on Monday, June 3, at 7:30 p.m., the Archive’s look at emerging voices in Czech cinema comes to a close with director David Ondříček in person for his taut neo-noir police thriller, “In the Shadow” (2012), which was the Czech Republic’s official Oscar entry for 2013. She is 28. Shown as Daisy Buchanan in “The Great Gatsby” by director Baz Luhrmann and production/costume designer Catherine Martin. 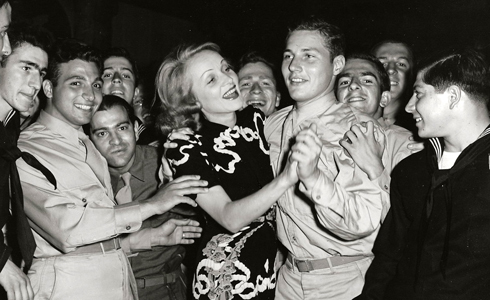 Marlene Dietrich dances with a serviceman at the Hollywood Canteen. Today I was thinking about the Hollywood Canteen, the club that entertained servicemen during World War II. What a feat of dedication and coordination! More than 3,000 stars as well as industry staff from producers to prop masters volunteered their talent, time and effort. A uniform served as a ticket for admission; food, non-alcoholic drinks, shows and dancing were free of charge. Housed at 1451 Cahuenga Blvd., the Canteen was typically open six nights a week and was in operation from Oct. 3, 1942 to Nov. 22, 1945. Key to the venue’s formation and success were Bette Davis, John Garfield and Jules Stein (Davis’ agent). You can read more about the Hollywood Canteen here.